Got kids? You may be less likely to splurge on your own mom this Mother's Day. A new survey by DealNews found that people with children are actually less inclined to buy gifts for their parents on Mother’s Day: 44 percent of parents will buy their mom a gift this Mother’s Day, as opposed to 56 percent of consumers sans kids. Consumers showed similar thinking when it came to Father's Day: 28 percent of people with children will buy a gift for their dad, compared with 39 percent of consumers without kids. The survey consulted 650 DealNews readers. Fifty-one percent were male, 47 percent were female, and 2 percent did not disclose their gender, Heather Lovett, a spokesperson for DealNews confirmed to NBC News. "We were struck by the clear division in behavior between those with children and without," said Benjamin Glaser, features editor with DealNews. "It's not surprising at all when you think about it, it's just a stark difference in the numbers." Glaser reasons that when you have kids of your own, your attention shifts from your parents to them. And practically speaking, "there may not be enough time, money, or focus to get a gift and/or plan a Mother's Day celebration for both the mother of your child, and your own mother." Anna Lane, author of the blog Misadventures in Motherhood and the mother of two young kids, still gets the moms in her life a gift for Mother's Day — but it's definitely become less of a priority. "In the days before I had kids, I spent a lot of time carefully picking out individual personalized gifts for all the mothers in my life, but that was back when I had the luxury of time for things like showering and driving to 10 different stores in search of the perfect ecru-colored vase," Lane told NBC News. "Oh, and I wasn't paying for preschool and food for two kids, so I had a heck of a lot more cash to spend on stuff like room spray and pajamas." But it's not just time and money holding Lane back from splurging. She also has a more informed opinion of what her mom actually wants (or more pointedly, what she doesn't want), now that she herself is a mother. "I have a new understanding of why my mom always told me she didn't need any more 'stuff,'" said Lane. "I spend half my time trying to get rid of all the clutter that clogs my house, so the last thing I need is more tchotchkes to dust or give away. This year I'm just going the easy route and buying every mom in my life a gift certificate to Drybar, because everyone loves a good blowout and it means Mom will get what she wants most of all: alone time." Erin Zavala, a mother of two based in Los Angeles, has made a similar observation of her own mom and what she genuinely wants of the holiday. Rafael Lena, who has one young son and lives in New York City, has also stopping buying stuff for his folks on Mother's and Father's Day. "I am much more inclined to [invest in] events — like dinner, a play, or a concert," said Lena. "Something that takes up a few hours and not much brainpower so that I don't really have to think about what to get, and can return to trying to remember to give my kid a second dose of amoxicillin." Like Lane, Lena has also learned that his parents prefer quality time over gifted products. But there are those parents who, now realizing the challenges of raising children, are more inspired to make a big deal of these holidays — and put more effort into purchasing the ideal present. Juan Martinez is on the same page. The Brooklyn-based father said that he’s more invested in Mother’s and Father’s Day since becoming a dad. Mindy Wells Hoffbauer, an Ohio-based mother of two grown kids dreams of the day when her children will finally accept that she "doesn't need anything else," and that they shouldn't stress over what to get her. All she really wants, she adds, is to have dinner with them. And as for her own parents? "I used to make a fuss about getting them something memorable, but now they're lucky if I think to send them something from Amazon (without a note)." 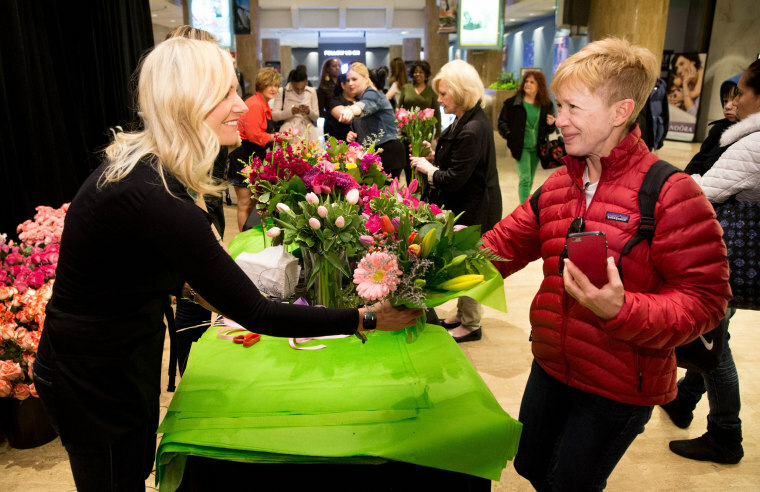 If you’re one of those parents who wants to get something nice for your mom this Mother’s Day, but are busy with your own kids, or merely tight on time and money, consider some tips from shopping experts. Kendal Perez, saving experts for CouponSherpa, suggests buying a gift that mom can redeem after the holiday, when some of the chaos has died down. Perez also recommends scoping out the latest online deals geared at Mother’s Day. If you want to take mom out on Sunday, check out some venues offering discounts for the holiday. Brent Shelton, online shopping expert at FatWallet, suggests poking through the latest deals on LivingSocial and Groupon, as well as signing up with eBates to get more bang for your buck. “Ebates.com right now is pretty advantageous since they are coinciding their anniversary sale with Mother's Day and offering 15 percent cash back from more than 200 retailers,” said Shelton. And of course, you don’t need to be a parent to enjoy these deals. After all, it’s not just moms and dads who are keen on savings!